Jean-Luc Mélenchon (French pronunciation: ​[ʒɑ̃.lyk me.lɑ̃.ʃɔ̃]; born 19 August 1951) is a French politician. 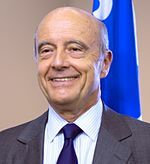 After joining the Socialist Party in 1976, he was successively elected municipal councilor of Massy (1983), general councilor of the Essonne departement (1985), and senator of the same department (1986, reelected in 1995 and 2004). He also served as Minister-Delegate of Vocational Education between 2000 and 2002, under the Minister of National Education, Jack Lang, in the cohabitation government of Lionel Jospin. He was part of the left-wing of the Socialist Party until the Reims Congress of 2008, at the outcome of which he left that party to found the Left Party with deputy Marc Dolez. He was the president of the party, and then the co-president of it, along with Martine Billard, until August 2014. 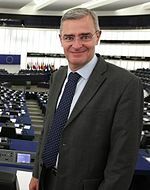 As leader of the Left Party, he joined the electoral coalition of the Left Front before the 2009 European elections and was elected member of the European Parliament in the South-West constituency (reelected in 2014). During the protest movement against the pension reform of 2010 his public stature grew thanks to his many public and television appearances. He was also the candidate of that coalition in the 2012 presidential election, at the outcome of which he came in fourth, receiving 11.1% of the votes. He is a candidate in the 2017 presidential election “outside the frame of political parties”, and founded the movement “Unsubmissive France” (FI) in February 2016. Born in Tangier (Tangier International Zone), he was educated at the Lycée Pierre-Corneille in Rouen (Normandy). His father was a postmaster of Spanish descent, and his mother was a primary school teacher of Spanish and Sicilian descent. He grew up in Morocco, until his family moved to France in 1962. With a degree in philosophy from the University of Franche-Comté in Besançon, and having gained the CAPES (a professional teaching qualification), he became a teacher before entering politics. Jean-Luc Mélenchon left Besançon to enter professional life in Lons-le-Saunier (Jura) and joined the Socialist Party (PS) in September 1976. He soon assumed local and departmental responsibilities (deputy section secretary of Montaigu) and developed a federal newspaper that fought for a union between PS and the French Communist Party (PCF). It was at this time that the latter broke the agreements of the union of the left on a joint program of government. He then came to the attention of Claude Germon, mayor of Massy (Essone) and member of the executive office of the PS responsible for the business section. Without stable work after his application was rejected at the Croix du Jura newspaper, he was hired by Claude Germon to become his private secretary. He became one of the leading Mitterrandist leaders of the Essonne federation, which led him to the position of first secretary of this federation at the Valence Congress in 1981 – he remained in this position until 1986. Positioning himself both against the “Second left” of Michel Rocard and the “Center of socialist studies, research and education”(CERES) of Jean-Pierre Chevènement. He was elected senator during the senatorials of 1986. 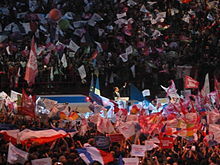 At the Reims Congress, in September 2008, the political current “Trait d’union” created after the victory of the “no” in the French European Constitution referendum of 2005, Mélenchon makes a new contribution. On the eve of the filing of the motions, an agreement was reached between the seven contributions of the left wing of the PS, and Jean-Luc Mélenchon is one of the signatories of the motion C entitled “A world of advance”, led by Benoît Hamon. He described this gathering as a “historic event”: for the first time, this motion brings together all the sensibilities of the left wing of the PS, with emblematic personalities like Gérard Filoche, Marie-Noëlle Lienemann and Paul Quilès. On 6 November 2008, the Socialist militants voted to decide between 6 motions. The motion supported by Ségolène Royal led with about 29% of the votes cast, while the one led by Benoît Hamon came in fourth with 18.5%. For Jean-Luc Mélenchon, it is a victory of the outgoing majority, which carries 80% of the votes (with the three firsts motions) and, among them, the motion advocating the alliance in the center. 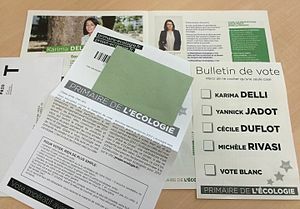 Believing themselves too far from this trend to the point that it would not be useful to take part in the congress, Jean-Luc Mélenchon and Marc Dolez announced on November 7 their decision, “by fidelity to their commitments” and for their independence of action, to leave the Socialist Party and to create a new movement “without concession facing the right”. They announce “the construction of a new left-wing party”, simply called the “Left Party” (on the German model of Die Linke), and call for “the constitution of a left-wing front for the European elections”. On November 18, in a meeting with the French Communist Party, the two parties announced their alliance in the form of a “partnership”, within the framework of a “left front for another democratic and social Europe, against the ratification of the Treaty of Lisbon and the current European Treaties”. The launch meeting of the Left Party is held on 29 November in Saint-Ouen, in the presence of Die Linke’s co-chairman, Oskar Lafontaine. Jean-Luc Mélenchon in 2013 in Toulouse. Mélenchon represented the Left Front in the Pas-de-Calais’ 11th constituency, to confront his rival Marine Le Pen, where she had over 31% in the presidential election. 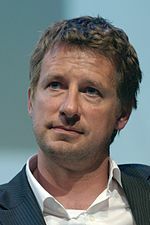 He received third place with 21.46% of the vote, narrowly edged out for second by Socialist Party member Phillip Kemel. 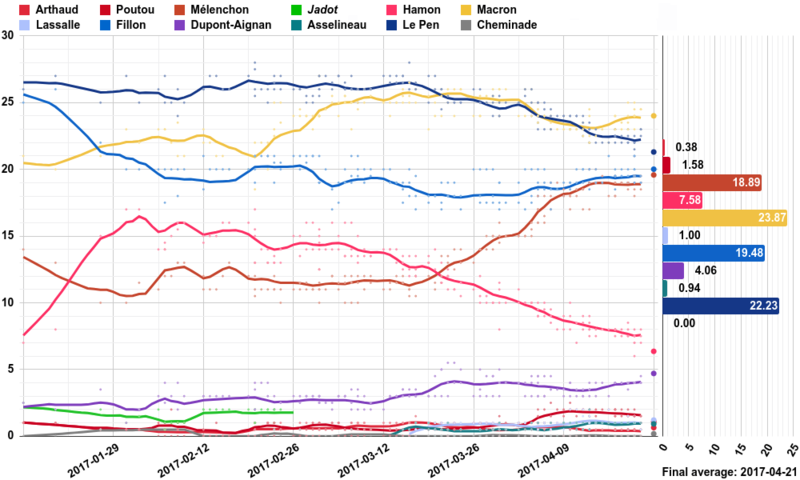 Mélenchon decided not to stand in the second round of the election after this result. During the presidency of François Hollande, Mélenchon became one of the most critical voices in the left against his centrist free-market policy. He denounced a betrayal to the culture and ideas of the French Left. For the second time, Mélenchon is running for the presidential election. His candidacy is endorsed by a political platform he founded, Unsubmissive France. This platform is endorsed by several parties, as the Left Party and the French Communist Party. Thanks to the electoral force of the PCF (allied with the Socialist Party), he got the 500 sponsors to be validated by the Constitutional Council. However, he is currently placed fourth in the polls while he was third before the Socialist primary and the bid of Emmanuel Macron. He is in favor of the establishment of a Sixth Republic and preserving the environment. According to the NGOs for the development aid Action Against Hunger, Action santé mondiale, CARE France and ONE Campaign, Jean-luc Mélenchon is the candidate in the presidential election who is the most engaged regarding international solidarity. Together with other French intellectuals, he vigorously denounces free trade between France and the United States as an example of global exploitation. Jean-Luc Mélenchon is a socialist republican and historical materialist, inspired primarily by Jean Jaurès (the founder of French republican socialism). He is a proponent of increased labour rights and the expansion of French welfare programmes. Mélenchon has also called for the mass redistribution of wealth to rectify existing socioeconomic inequalities. 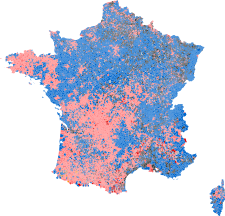 Domestic policies proposed by Mélenchon include a 100 per cent income tax on all French nationals earning over 360,000 Euros a year, full state reimbursement for healthcare costs, a reduction in presidential powers in favour of the legislature, and the easing of immigration laws. He also supports the legalisation of cannabis. 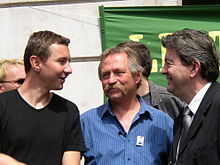 Jean-Luc Mélenchon (right) with Olivier Besancenot (left) and José Bové (centre) at a meeting to rally support for the “No” vote in the European Constitution referendum of 2005. Mélenchon is an outspoken critic of the European Union (EU), which he claims has been corrupted through neoliberalism. During his 2012 campaign, Mélenchon positioned himself against the trend towards economic globalisation, which he denounced as disproportionately profiting the financial industry and “high income earners” at the expense of the poor. He insisted international organisations such as the EU threatened to “strangle the voice of the people”. He also supports a renegotiation of European treaties. Mélenchon opposes the North Atlantic Treaty Organisation (NATO), which he perceives as an affront to France’s national sovereignty. He has repeatedly called for France to withdraw from NATO. After the German Chancellor in December 2014 classified the reform efforts so far in France and Italy as insufficient, Mélenchon told Merkel through Twitter: “Shut your mouth, Mrs. Merkel! France is free.” Jean-Luc Mélenchon, however, denies being prejudiced against the Germans and claims to have founded his party hand in hand with Oskar Lafontaine.After the referendum in the Greek sovereign debt crisis in early July 2015, he said that the “right-wing German government” was primarily responsible for the aggravation of the crisis. Minister of Vocational Education, 2000–2002. Member of European Parliament since 2009. Vice-president of the General Council of Essonne, 1998–2001. 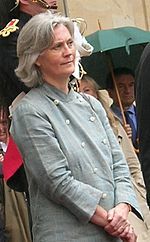 General councillor of Essonne, 1985–1992, 1998–2004. Reelected in 1998. Deputy-mayor of Massy, Essonne, 1983–1995. Municipal councillor of Massy, Essonne, 1983–2001. Reelected in 1989, 1995. Co-President of the Left Party, 2008–2014. Mélenchon, Jean-Luc; Amar, Cécile (22 March 2017). De la vertu (in French). Editions de l’Observatoire. ISBN 979-1032900598. Mélenchon, Jean-Luc (1 December 2016). L’avenir en commun : Le programme de la France insoumise et son candidat (in French). Seuil. ISBN 978-2021317510. Mélenchon, Jean-Luc (16 November 2016). Le hareng de Bismarck: Le poison allemand (in French) (paperback ed.). J’ai lu. ISBN 978-2290127940.